This article is about the Mario Kart item. For a similar item in Puzzle & Dragons: Super Mario Bros. Edition, see Spiky Shell. Bowser's Shell is a Special Item exclusive to Mario Kart: Double Dash!! that Bowser and Bowser Jr. can receive. Much like any other Special Item, King Boo and Petey Piranha can also receive it. It is a gigantic shell that, when released, bounces around the track like a normal Green Shell, toppling any kart that it hits as well as knocking down the rear character, making the racers drop their items and temporarily disabling them from switching. After Bowser's Shell hits the walls of a course roughly fifteen times, the shell breaks apart. 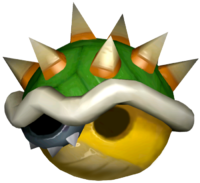 Unlike many other items, the Bowser Shell can resist being destroyed by some other items, and even bounces off another special item should it collide with one. The item reappears as one of Bowser's items in Mario Kart Arcade GP 2 and as an item any character can use in Mario Kart Arcade GP DX. This item was also going to appear in Mario Kart DS, and the model for it is still in the game. Bowser holds a Bowser's Shell. This page was last edited on July 29, 2018, at 12:56.